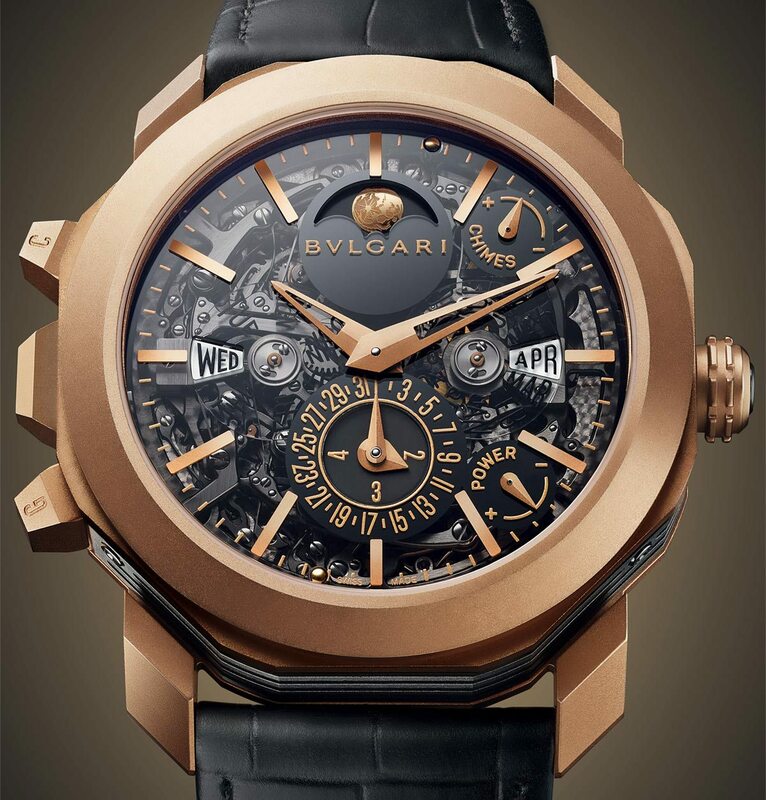 Tourbillon, minute repeater, petite and grande sonnerie, perpetual calendar, moonphase and GMT – Bulgari’s new Octo Grande Sonnerie Perpetual Calendar is all of these things, making it the most complicated watch ever produced by the luxury brand founded in 1884. The grande sonnerie (meaning “grand strike”) which gives the piece its name combines a quarter striking mechanism with a repeater; every 15 minutes it strikes the number of quarter hours audibly on a gong, and then the number of hours since the last hour on a second gong. 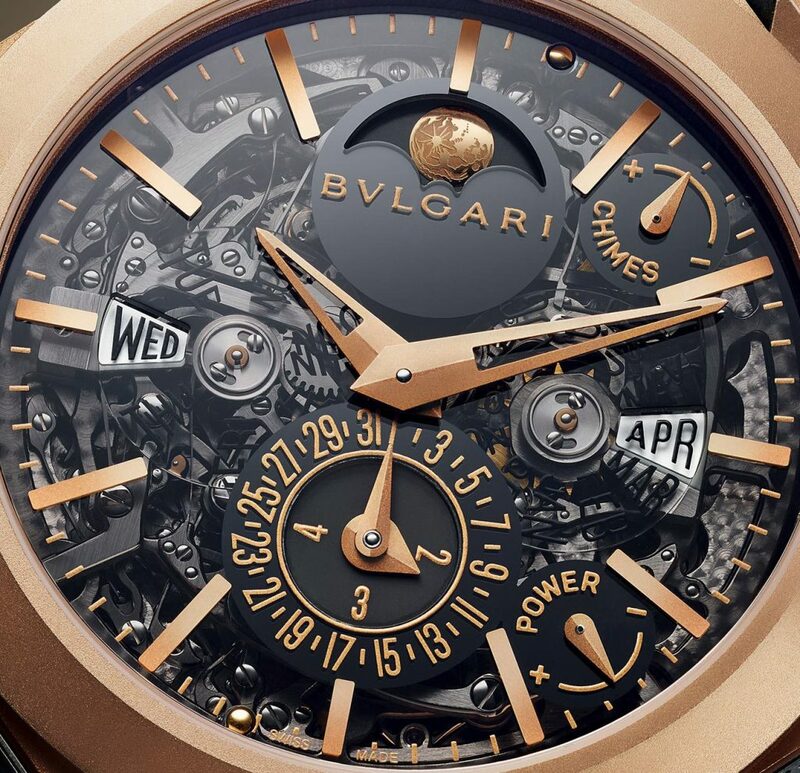 The 44mm timepiece further demonstrates Bulgari’s dedication to go beyond its origins as a jewelry maker catering to Italy’s aristocracy, a mission it has made clear since having acquired independent watchmakers Daniel Roth and Gerald Genta in 2000. The original Octo was designed by the legendary Gerald Genta, the Swiss genius who was also responsible for the Omega Constellation (1959), Audemars Piguet Royal Oak (1970), IWC Ingenieur (1976), Patek Philippe Nautilus (1976) and Cartier Pasha de Cartier (1985), and it shares much of its DNA with the Royal Oak. However we doubt even Genta, who died in 2011, could have imagined how far Bulgari would take his creation. Applying their principle of occupying “the intersection between Roman architecture inspiration and contemporary design genius,” the Octo has given them true watchmaking credibility. Its movements are designed in-house and have won many awards at the Grand Prix d’Horlogerie de Genève, aka the Oscars of watchmaking, and they’re credited with feats such as the world’s thinnest minute repeater, the world’s thinnest tourbillon, and the world’s thinnest automatic watch. Housed in Bulgari’s iconic multi-sided Octo case made of 18kt rose gold, the Grande Sonnerie Perpetual Calendar is undoubtedly a tour de force of haute horlogerie, though it’s hard to imagine anyone less than Tony Stark wearing this thing.